The Walt Disney Company is diving into its 'vault' to remake its catalog in a naked cash-grab that might be embarrassing if not for the fondness many hold for their films. So far, we've seen remakes of Cinderella, Sleeping Beauty via Maleficent and The Jungle Book. Now we have Dumbo, with live-action remakes of Aladdin and The Little Mermaid waiting in the wings. I enjoyed the Cinderella and Jungle Book remakes. I liked Maleficent well-enough. Dumbo is another creature altogether, a strange adaptation where I am almost willing to praise it if only for the fact that director Tim Burton essentially took Disney's money and used it to bash the very company counting on him to give it more money. In 1919, World War I veteran and former horse-riding master Holt Farrier (Colin Farrell) has finally returned to the Medici Brothers Circus and his children Milly (Nico Parker) and Joe (Finley Hobbins). Holt finds that he is now a widower and the children find he lost his arm. While Mancini Brothers owner/ringmaster Max (Danny DeVito) is fond of Holt, he cannot find a place for a one-armed former trick-horse rider in his circus. He does squeeze him in taking care of the elephants, especially one about to give birth. A baby elephant, Max figures, will attract patrons to his struggling circus. Unfortunately, the new elephant, Jumbo Jr., is born with freakishly long ears. Max is appalled, Holt attempts to be kind, and the children discover thanks to Milly's more scientific mind that Jumbo Jr., now nicknamed 'Dumbo', can fly if he snorts a feather through his truck. Separated from his mother after she rampages to protect her child, Dumbo (and Holt) is put into the clown act where Dumbo takes to flight. 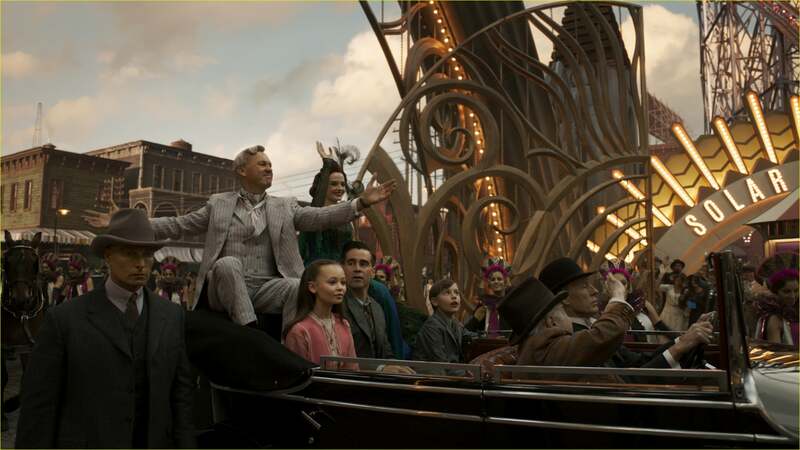 News spreads quickly, catching the attention of theme park impresario V.A. Vandervere (Michael Keaton). Vandervere talks Mancini into bringing his troupe to his Coney Island theme park, Dreamland by making Mancini a partner and promising jobs for everyone. 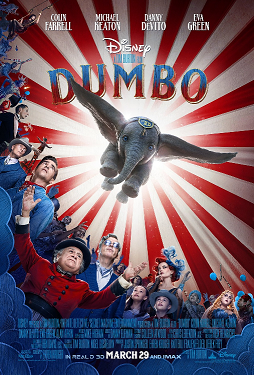 Dumbo is quickly corralled into being the star attraction, only now he must join Colette (Eva Green), a trapeze artist/Vandervere's mistress. Their debut is a disaster when Dumbo realizes his mother is in another part of Dreamland. Vandervere breaks all his promises and plans to kill Dumbo's mother, but the troupe with Colette's help engineer a plan to save Dumbo and his mother and bring down Vandervere. The revamped Mancini Brothers Circus now is animal-free, Holt and Colette are now firmly involved and Dumbo & Mother are in the Asian jungle, free from all humans. One might imagine that despite the somewhat cutesy reputation Dumbo has that a remake would be right up Burton's street. It is centered around circus folk and has a protagonist with a unique feature not only an Edward Scissorhands or Ed Wood. What Dumbo lacks however, is a reason for being. It is surprising that the main character is essentially superfluous to the film. Dumbo himself is pretty much irrelevant to Dumbo. You could have had any other eccentric character take his place and the film would have been the same. It might even have been better. Dumbo looks sad most of the time, but apart from a feather fetish he does not have much to him that makes one care all that much about him. I think this is because Ehren Kruger's screenplay is more interested in our human characters and their morose lives to give our pachyderm much thought. When Dumbo takes flight for the first time for example, it should be his personal triumph against all those who mocked him and mistreated him. Instead, you feel pretty much nothing. Even worse, what should be the conclusion for Dumbo ends up being just the end of the second act, and this is where Dumbo goes off the rails. Dumbo is openly subversive, if that makes any sense. Burton and Kruger openly ridicule the Walt Disney Company, and I cannot believe that the high-ups would be so dense as to miss how the film insults them. Dumbo's position is in how Dreamland (read Disneyland/Walt Disney World) is essentially the antagonist. Dreamland is pretty much mocking the theme resort: my mother commented while watching that Dreamland was really EPCOT, down to a 'Wonders of Science' Pavilion. Vandervere, this impresario who tells Max that it's more economical to bring the audiences to the show rather than vice-versa, is as close to a bashing of Walt Disney as I've seen in a long time. I figure it delighted Burton and Kruger that they got a chance to trash the very company that financed the film, but it's as overt as I have seen. They even managed to throw in a good 'animals should not be entertaining humans and should live only in nature' message for good measure. There is also something wildly wrong with the performances. Parker seems to be doing her best Wednesday Addams impersonation, making Milly less the bright scientifically-minded girl and more a creepy, almost ghoulish monotone-speaking figure. I was waiting for her to call her brother 'Pugsly'. Farrell goes all-in on some Texan-Oklahoman accent that he mostly hangs on to, but he too appears monotone, though to be fair he didn't have much to work with. Green seems to be keeping up with him in looking almost bored throughout Dumbo. It seems that Dumbo has two types of performances. There's the Parker/Farrell/Green performances: somewhat bored and emotionalless. Then there's the Hobbins/DeVito/Keaton performances: wildly over-the-top with the latter having some oddball accent that gives Farrell and Green a good run for the money as to who could sound the silliest. There are shout-outs to the original, particularly the songs. Max likes to hum and sing snippets of Casey Junior, one of the circus folk sings part of Baby Mine and Pink Elephants on Parade (or at least elements of it) can be heard when Dumbo's Dreamland opening show begins via a lavish bubble making number. Granted, When I See An Elephant Fly could never be performed now given how the original veered towards blackface, but even that gets a nod. However, the songs, like the main character, seem almost an afterthought, included almost because they are contractually obligated to be there. Dumbo is not a nostalgia trip for those who remember the animated original (the lack of Timothy Mouse was especially disappointing to me). It is grossly unfair to compare the original and remake, though for me the sweetness and positive message the original Dumbo had is lost here. Instead, we get a critique of glitzy theme parks and using animals in circuses and worse, a film that has no real reason for being. I found sadly that in the end this Dumbo is as unnecessary as the main character was to the film itself.